The Cariton table collection features an Oversized cocktail table and matching end tables. 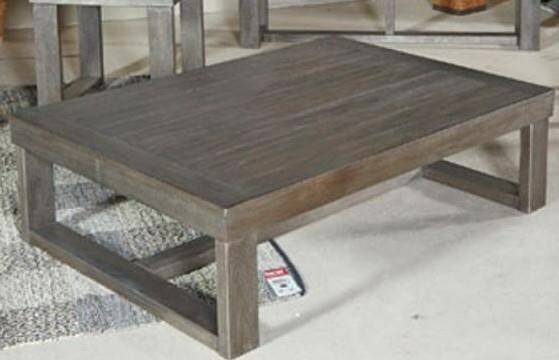 It is shown in a brown/ grayish finish and constructed using Ash Veneers. This group would look great with a large sectional or in a Big room! The T471Cariton Oversized Cocktail Table by Ashley Furniture at Furniture Fair - North Carolina in the Jacksonville, Greenville, Goldsboro, New Bern, Rocky Mount, Wilmington NC area. Product availability may vary. Contact us for the most current availability on this product. The T471Cariton collection is a great option if you are looking for furniture in the Jacksonville, Greenville, Goldsboro, New Bern, Rocky Mount, Wilmington NC area. Browse other items in the T471Cariton collection from Furniture Fair - North Carolina in the Jacksonville, Greenville, Goldsboro, New Bern, Rocky Mount, Wilmington NC area.